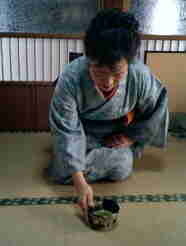 I've been learning tea ceremony for many years. In the tea ceremony, as the seasons change, we change a set of tea instruments to the one that is supposed to match well to the current season. And also the room where the tea ceremony is held is modified quite differently to produce the atomosphere of the season. This is to entertain the guest(s) in the beauty of the nature. Let me show you how our tea ceremony practice room is changed in each season.